Regular price: $850. You save $251.00 This Special is offered for a limited time!! 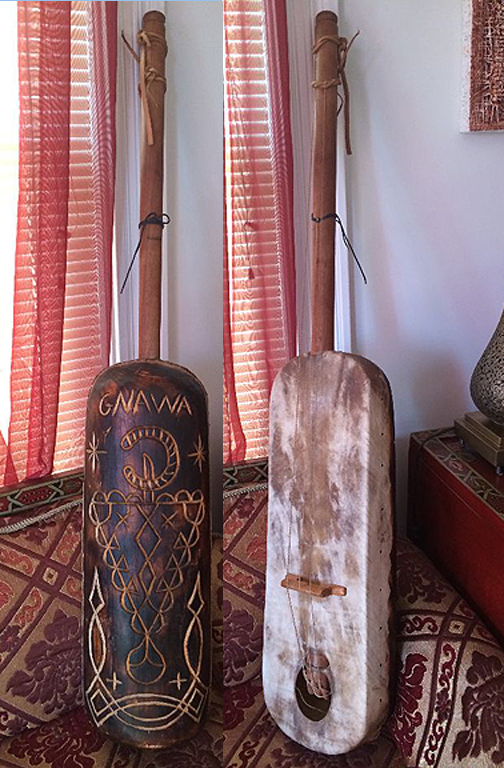 A three-stringed long-necked lute, also called guinbri or sentir, is the main melodic instrument of the Gnawa. This plucked lute (guinbri or sentir) is one of the most common stringed instruments found in West Africa and is known to be from the family of the khalam in Senegal or ngoni in Mali. It is also said to be the ancestor of the American banjo. This guinbri or sentir is made from a hollowed tree trunk covered with camel or cow skin stretched to form a soundboard. It is beautifully carved with good luck motifs. This sentir comes with a metal part with rings, also called sarsal or sarsar which mounts at end of the neck by entering tight the pointy end of the sarsar into the preexisting whole at the top end of the neck.. The neck is basically a wooden pole, and the three strings are goat/sheep gut which are very traditional. The strings are tuned in fourths and held with leather bands that serve as tuning pegs, just like the real masters did and still do. With the guinbri or sentir, Gnawa (descendents of former enslaved people from the sub-Saharan region) play music with intricate textures and astonishing rhythmic patterns with great pleasure! For the appreciation, we throw in a FREE black case, a free extra set of cords and a free audio CD with music played using a Gnawa guimbri! Which will give you an idea/sample of how it is played. Please keep in mind that we do adjust shipping depending on your shipping address. We make the adjustment in shipping cost after we have received your order. A copy of the adjusted invoice will be included in with the shipment.